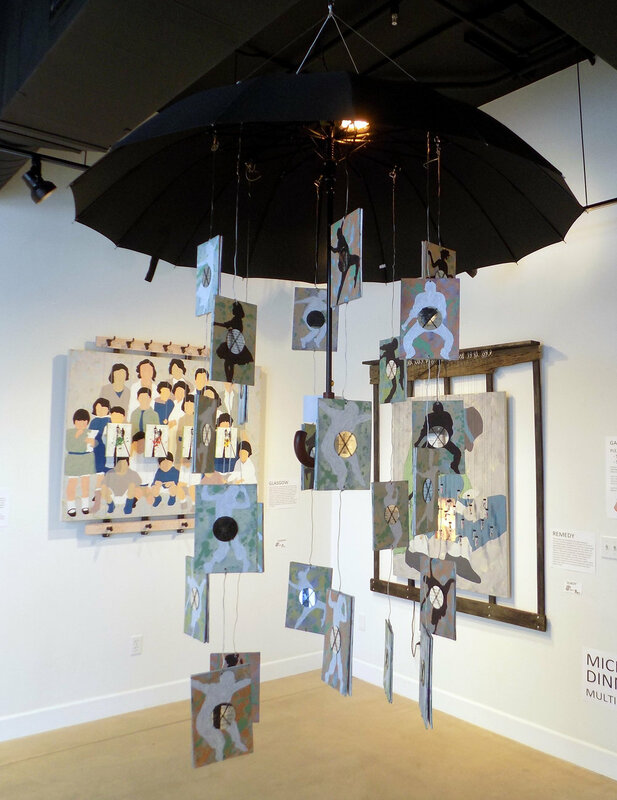 Parade is a series of free-standing pieces created as my homage to these great community gatherings - the small neighborhood parades of memory, the big holiday parades of tradition, and the jazz funeral parades in New Orleans. Years ago I attended Mardi Gras, and completely fell in love with the spectacle of the big parades, but even more so with the smaller neighborhood parades which bring everybody together and delight all New Orleanians from all parts of the city. See the Series page to see more details of this piece here. Neighborhood is about the communities that we create, and how those communities are built of individuals, each with their own story and identity. 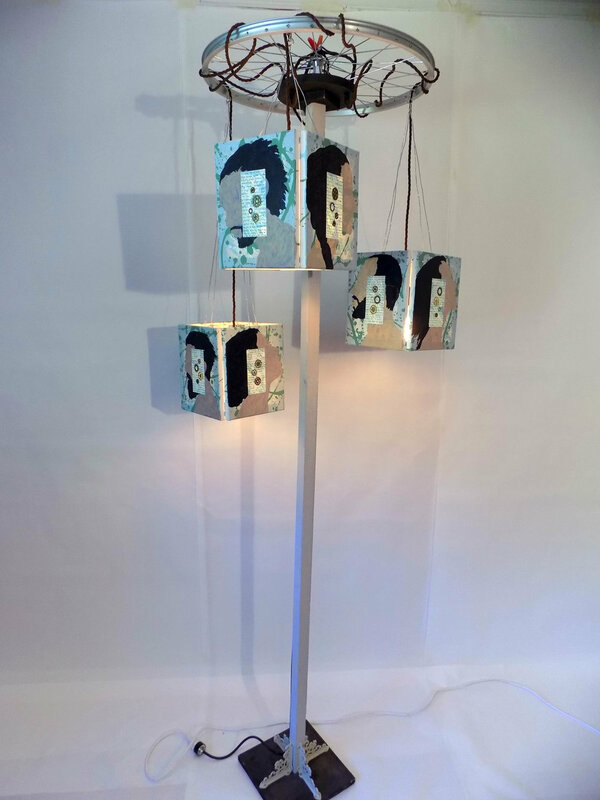 This piece is intended to be seen from two sides - from the outside looking in, where the glass and light obscure the details of the individuals, and from the inside out, where the world is seen through a kaleidoscope of individuality. Both sides are framed with personal stories from my childhood, the stories that shaped who I’ve become. Bedlam is a companion piece for the Parade series. It is also a small homage to the age of circus, a community gathering event of a now bygone past. 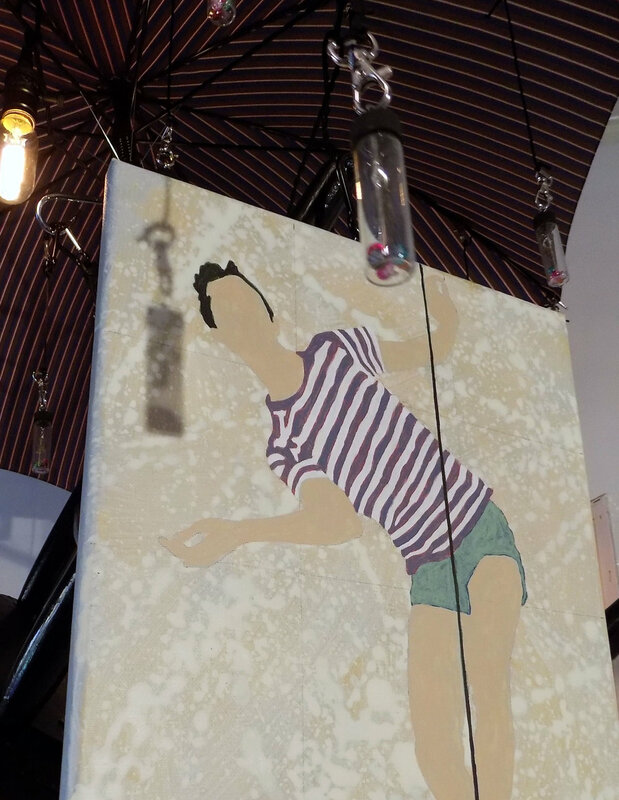 Featuring painted images of circus performers from the past suspended from an IV pole and upended chair, the piece is intended to be mostly whimsical, but with a small hint of the dark history of the traveling caravans. I’ve been interested in the idea of using back light in a sculpture, and developed this piece as a way to employ it to further the expressive intent of the artwork. 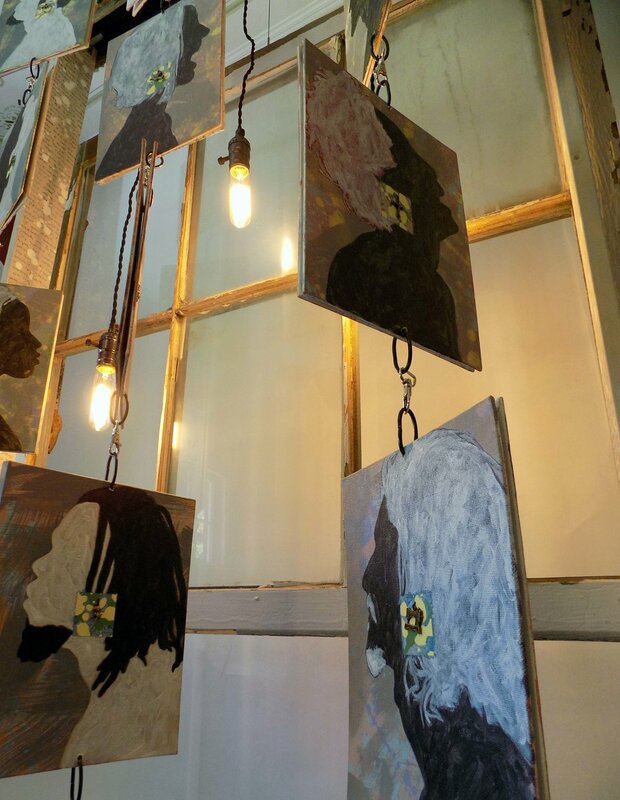 The portraits painted on each lantern are superimposed by childhood memories, and the back-lighting is intended to give life the words. The gears stitched across the words are representative of the inner workings of thought, feeling and memory. 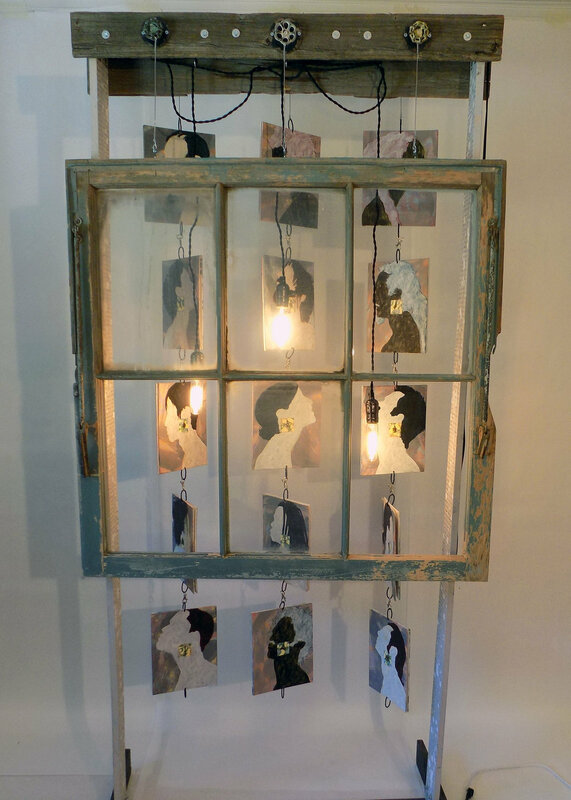 Each lantern is held up by a bicycle tire rim, a reference to the childhood evinced by memory. This piece was completed as a counteract to the seeming chaos of the political world around us - it’s a piece about finding joy. 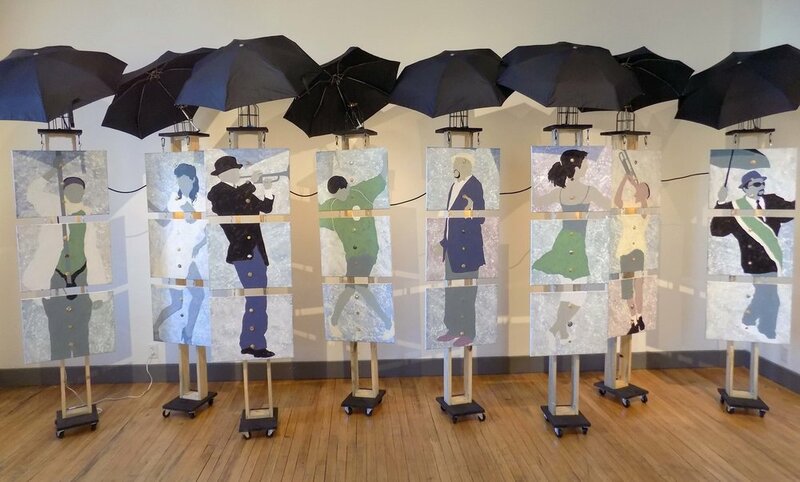 The umbrella suspends painted images of dancers, protecting them from the grey skies above and around. 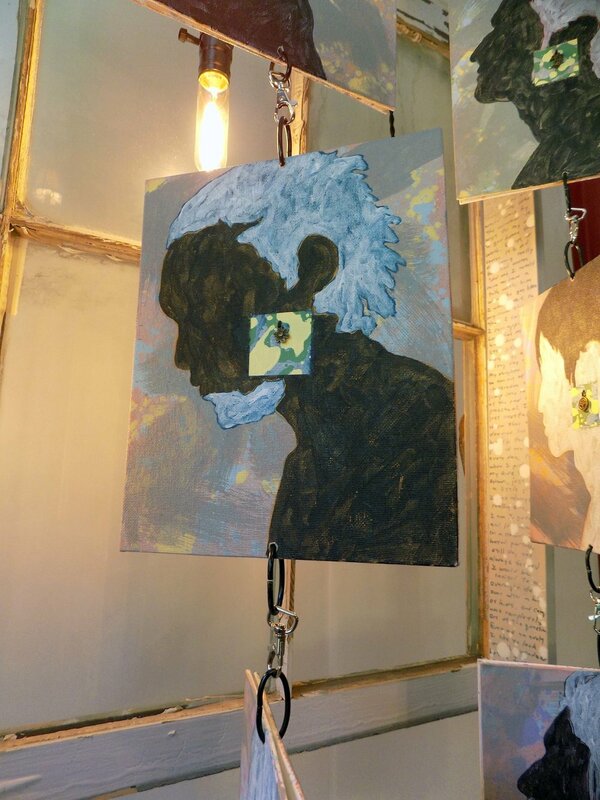 Each mirror sewn to each canvas displays a literary quote, either from a book I love, or a quote that I found that I enjoy. The text has faded with time, as memory does, providing a murmur of recollection. The mirrors represent how the things that we pursue, and love, help to define who we become, and reflect back to the world who we are - reflect joy and you are joyful, reflect anger and you are angry, reflect fear and you will be seen as afraid. Lost is about a time a year ago when my seven year old son developed a manic fear of being lost in public. I, of course, reassured him continually that that could never happen, but as a father I could not help but ingest some of that fear, and consider the terrible possibility ever coming to pass, and this piece is about that fear. 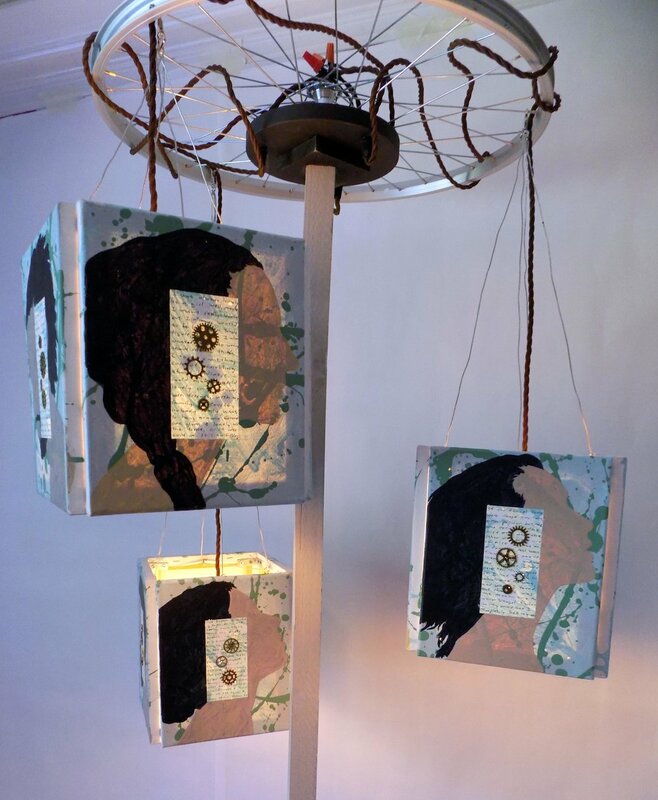 The empty chairs centered in each canvas represents a missing child, and the light partially hidden behind each canvas symbolizes a life obscured by loss. 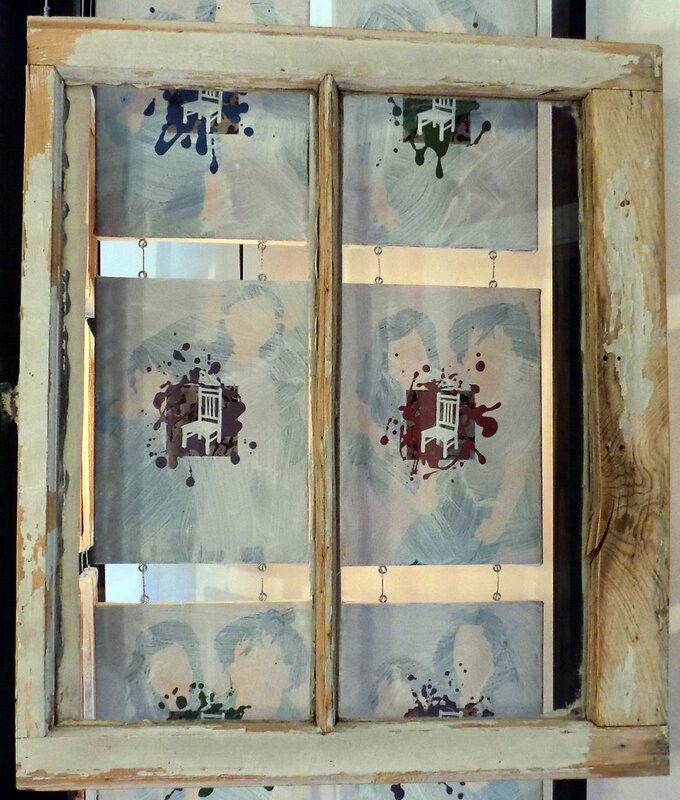 The windows allow the viewer to look in, as when wandering a neighborhood and looking into a house that has been visited by tragedy. 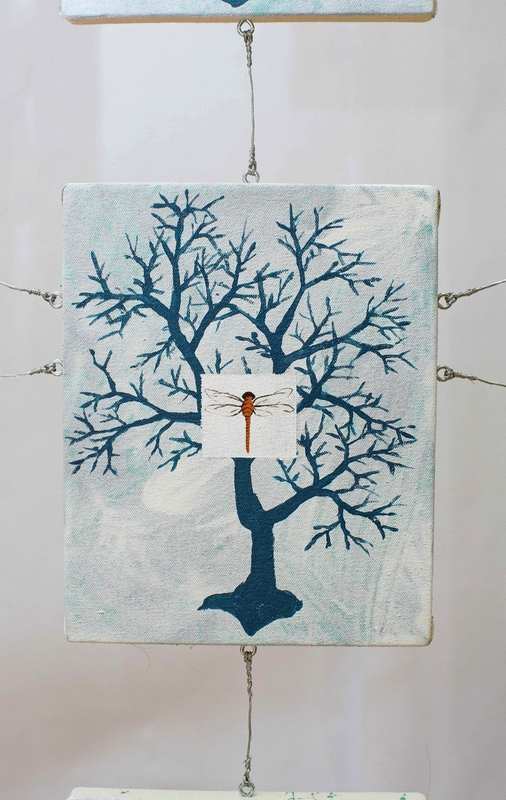 Disconnect is about the sometimes solitary nature of living in rural lands. Having lived in Eastern Washington the last 12 years, and having travelled extensively through the Northwest and high plains, I have developed a great love for the open spaces and nearly empty expanses of the Western United States. There is a stereotype of the west as a land peopled by solitary individuals, and that is represented by the black crows featured on each panel of the screens. 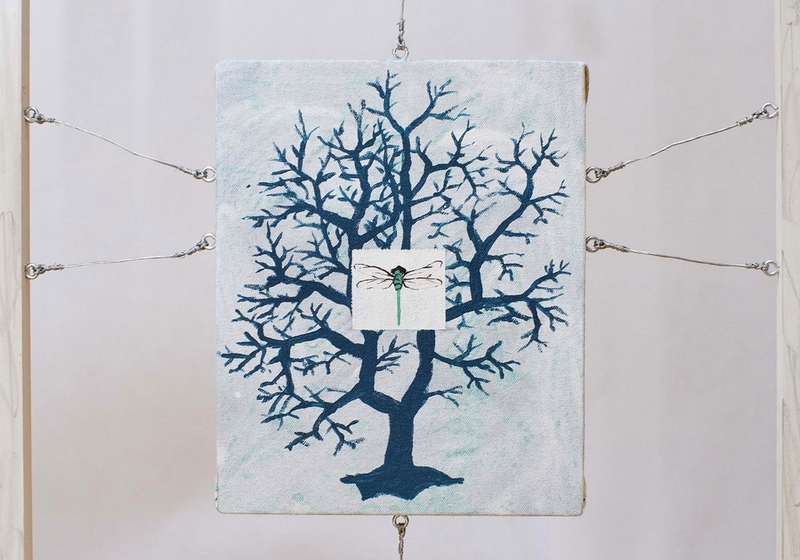 Behind that is an image of a white crow superimposed over written narratives of life lived in the west and on the plains, which symbolizes the ghost of civilization that runs through the phone lines, a web that connects the little cities, tiny towns and solitary farmhouses. Developed as part of a three part series exploring the state of being an American in a turbulent and uncertain time, Fortress is about the idea that the needs of the people is bound to the needs of the state, and that individuality can be subsumed by the drives of the nation. As the debate continues about who can or should join our society, and who is or isn’t a threat to our society, the value of individuality can be discarded for a sense of unity in a country that perceives itself to be under attack. Even so, the light of the nation comes from the people that compose it, and repressing that light may not, in the end, be in the best interest of the country. Phonebooth is my homage to one of my favorite places on earth, London. When conceiving this piece I wanted to avoid the usual imagery of the Queen, Big Ben, etc, and instead deconstructed the iconic London phone booth. The ravens on each panel are superimposed over passages of Martin Amis’ book London Fields, one of my favorites. The umbrella is a nod to the seemingly perpetual London drizzle, and it also acts as the roof which suspends a pendant light to backlight the phone booth. Delta is a piece about the Mississippi Delta and the blues performers who came of age in the 1920s and 30s. The central images of the blues guitars are superimposed over oral histories from some the people who lived at the time, chronicling their love of music, as well as the casual racism and brutality which they lived with daily. The lantern that rises behind the screen represents the joy and power of the music, which gave comfort to people in hard times, and which shaped and defined music and culture in America far beyond what the early musicians could have ever imagined. When attending Mardi Gras many years ago, I was struck by the torch bearers, dancing and cajoling the crowd, with butane tanks strapped to their backs and fire dancing above their heads. The Flambeaux carriers were originally African American slaves or free men of color, and the tradition began over 150 years ago. The crowds toss coins to the flambeaux carriers - it was a way for them to earn money for their task of lighting the way for the floats, and is a tradition that dates back to when the only compensation for the task was thrown by the crowds in appreciation. Today, 75 percent of the carriers have previous ancestors who were carriers, and they continue the tradition. Even so, fewer and fewer night parades are using flambeaux, and the tradition may one day soon become a historical footnote. “New Orleans Doors” is a reflection of the doors of New Orleans, both literal and spiritual. My intention with this piece is to capture something of the essence of the city, where courtyards of hidden gardens lie behind plain pine doors, and the tombs all lie above ground in ornate and derelict cities of the graveyards. There is also a spiritual aspect which is unique to the city, and can be at once mysterious and intrinsic. My intention with the piece is to focus on the mystery of the various doors, and the desires to unlock the doors and see what lies behind. Phone Lines is a meditation on the nature of staying connected in rural societies. There is a ghost of civilization that runs through the phone lines in the west, a web that connects the little cities, tiny towns and solitary farmhouses. Having lived in Eastern Washington the last 13 years, and having travelled extensively through the Northwest and high plains, I have developed a great love for the open spaces and nearly empty expanses of the Western United States. 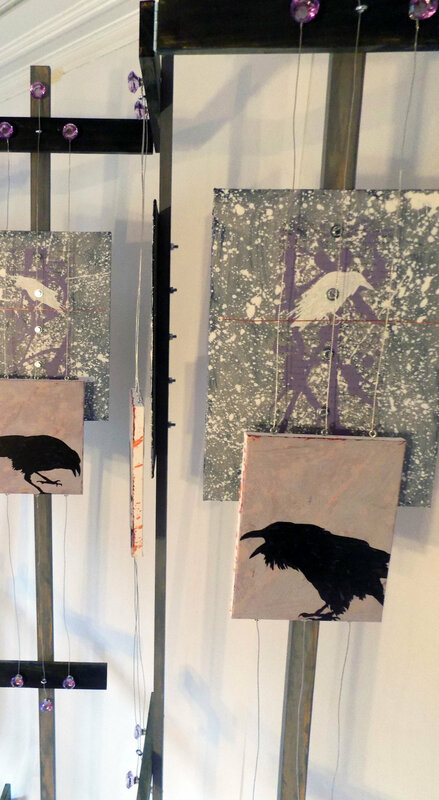 The crows on each canvas are superimposed over oral narratives of people living in the American West, solitary stories from a lightly populated part of the country can be far and arduous to travel. 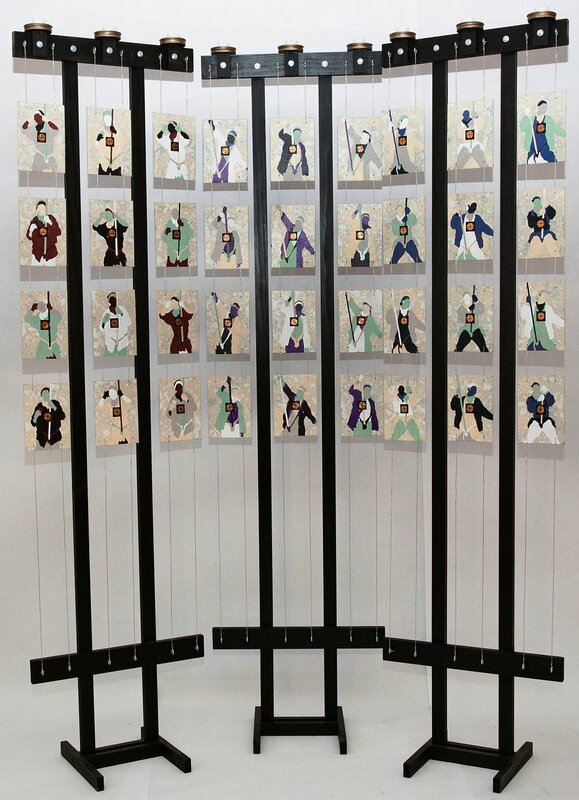 16 acrylic painted stretched canvasses suspended in wood frame by wire.